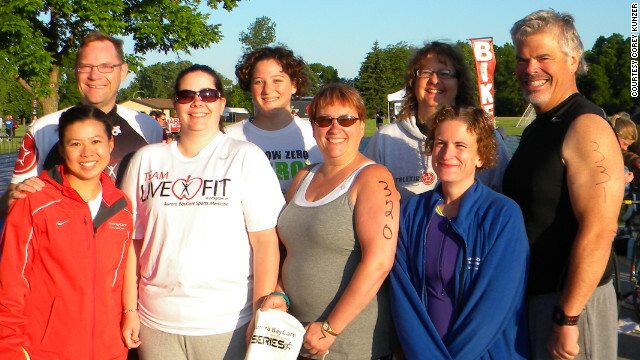 John, Kim, Amy, Lisa, Linda and Leslie became the LiveFit Six-Pack. Six people that for a variety of reasons had settled into unfit and unhealthy lifestyles. Individual and group training, along with a triathlon class, prepared them for the race in early June. During their preparation for the triathlon they all endured various aches and pains, but were rewarded with new accomplishments and achievements. They all felt ready for race day. The first Sunday in June was a perfect day for the race and for these six first-time triathletes. The water felt like it was just a few degrees above freezing and we were all happy to complete that part of the race, but the bike and run parts were uneventful - except for a few stumbles and mishaps in transition. All six completed their first triathlon with big smiles as they crossed the finish line, family and friends cheering. Not only did the Six-Pack complete their first triathlon, but many sports medicine staff members and several people that we were not able to pick also finished their first race. It was a great morning! The real results were even more visible. John has lost 65 pounds and is wearing clothes that have been in the back of his closet for a couple years. Amy, who had bariatric surgery 6 months before the challenge, has now lost 115 pounds and looks nothing like the woman she was a year ago. As a group they lost a total of 130 pounds during the 6-month challenge, and - more importantly - improved their overall health and cardiovascular fitness. The program was a huge success and the 2013 program is already being planned. I will continue to serve as team captain, but the success of the program is due to the dedication of the trainers, Corey and Junius, who have now changed the lives of six more people. It amazes me that this all started because I sat down to the computer in November 2010 and decided to apply to run a triathlon with Dr. Sanjay Gupta. Great work everybody. Please pay it forward, if each of the 6 pack help 6 others we'll have 36 more people healthier next year and so on. Way to go. And bernard this article has nothing to do with checks, health care or the president. Go back and finish you morning coffee and wake up. Get on the right page. Style is very like the quality is very good, no color, delivery speed super fast! Quality is very good, leather is very good, very strong tape, liked the quality is very good, logistics quickly, is not very fast delivery. Very good quality, color and style is my favorite, very satisfied with the quality is very good, colors and pictures no color, liked the quality is very good, color is very positive, very much, very good quality workmanship is very good, with the seller described exactly the same, very satisfied with the quality is very good, exactly the same description with the seller, very satisfied with the quality is very good, workmanship is very fine, very satisfied. Liked.